Jamel loses his friends to marijuana; Artiqua dates a boy of another race despite her family's opposition. Youniqiue was abandoned by her mother; Charlene is raising her brothers and sisters because their mother is addicted to drugs; Craig is gay and worried about coming out. All of these teens have more than their share of troubles. And all have the resiliency needed to face them, live through them, and move forward with courage, confidence, and hope. In 30 first-person accounts, teens tell how they overcame major life obstacles. Many aren't the everyday problems most kids encounter, which makes their stories especially compelling—and their successes especially inspiring. 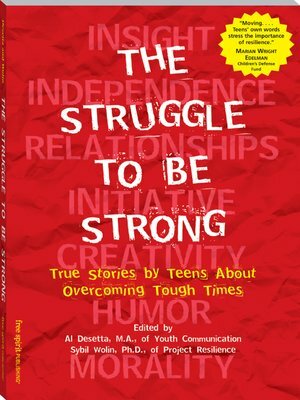 As teens read The Struggle to Be Strong, they discover they're not alone in facing life's difficulties. They learn about seven resiliencies—insight, independence, relationships, initiative, creativity, humor, and morality—that everyone needs to survive and thrive in even the toughest times. Vivid, articulate, and candid, this book will motivate readers of all ages to build the skills and strengths they need to triumph over adversity.